You may have seen videos of specially prepared supercooled liquid water freezing instantly when shaken or tapped, like ours below. But can you reproduce this demonstration at home? Many how-to articles on the internet tell you to simply put a bottle of water in your home freezer for some "to be determined" length of time, and while this can work, it's not very reliable. We'll show you a simple and almost fool-proof way to prepare supercooled water and impress your friends, while also experimenting with another interesting property of water. Several unopened plastic bottles of drinking water (try one or more of spring water, filtered water, sparkling water, distilled water or tap water). Don't use glass bottles. Fill the cooler about half full of ice and place it somewhere where it can sit undisturbed. Insert a thermometer in several places and measure the temperature. Add water slowly until you have about 2-3 times as much ice as water. Don't add too much water, just enough so that most of the ice moves around a bit easier, but not so much that it reaches the top surface of the ice. Measure the temperature again. Add some rock salt to the ice water bath, about 2 cups for each 10 pounds of ice that you used. Mix thoroughly and measure the temperature again. Let the ice-salt-water bath cool down for about 30 minutes, occasionally measuring the temperature. You should find that the temperature has dropped well below the normal freezing point, hopefully -1 to -5C (22-27° F). If the temperature is higher, add more salt. Place several bottles of water in the bath and leave them to cool. Continue measuring the temperature of the bath occasionally, but take care not to disturb the bottles too much. After about 2 hours, carefully remove one of the water bottles from the bath and examine it. It should be liquid, but at about the same temperature as the bath, and thus supercooled well below its normal freezing temperature. (If any of the bottles have frozen, remove them from the bath and let them warm until all of the ice inside has melted before reusing them). To instantly freeze a supercooled water bottle, hold it by the neck and tap it on the bottom with your other hand. If a snowflake or ice crystal forms, it should grow until the entire bottle is frozen. This may take just a few seconds to a minute, depending on how cold the water is. Another way to initiate freezing to to shake the bottle, but you won't be able to watch the crystals grow this way. If the bottle doesn't begin to freeze, smack it harder, perhaps on a table or countertop. If it still won't freeze after several increasingly aggressive attempts, then the water is not cold enough. Return the bottle to the bath and let it cool longer. If the temperature of the bath is above 27°F (-3°C) add more salt and/or ice. Most people believe water always freezes at exactly 32°F or 0°C. While it is true that pure water ice always begins to melt at 0°C, liquid water- even pure water- does not necessarily freeze at this temperature, and can remain a liquid at much colder temperatures (see the link below). This is called supercooled water. The reason this can happen (not just for water, but for many substances that form crystals in their solid state) is that molecules of a liquid behave a little differently than those in either the solid state (where they are tightly locked into an orderly arrangement or crystal lattice) or gas state (where they are completely independent). All that is needed for a solid to melt is heat, which provides the energy for the crystal lattice to break apart and become liquid. On the other hand, simply cooling the molecules in a liquid does not make them form a solid. The molecules must begin to arrange themselves and form an orderly crystal lattice, and this takes a little more energy (this sort of "borrowed" energy is called the latent heat of fusion). Think of it this way: it's much easier to destroy a boat than it is to build one from scratch. It takes some thought and care to start building your boat from the individual pieces. Forming a solid from individual liquid molecules is similar, the first few molecules must move into proper position and alignment to start building correct crystal lattice. Once this lattice begins to form, it becomes much easier for other liquid molecules to attach and continue growing the crystal lattice. The colder a liquid becomes, the more likely it is that some of the molecules will form that first crystal, but if they are not moving around much it may not happen. That's why we were very careful not to disturb the bottles until we wanted them to freeze. Tapping or shaking the bottle got the molecules moving around so that it became more likely that a few would move into the proper arrangement and form a crystal (called a seed crystal), then the rest of the molecules quickly attached, and the entire bottle froze. The freezing or melting point of a substance is actually defined as the temperature at which the liquid and solid phases are in equilibrium. For pure water this means that ice is melting at exactly the same rate that liquid water is freezing so that the net amount of each stays about unchanged, and that occurs at exactly 0°C. This perfect equilibrium might seem very difficult to achieve, but actually as long as your bath contains plenty of both ice and water, and you are not adding or removing too much external heat (i.e. the cooler is well insulated), the phases will find their equilibrium and the temperature stabilize ayt 0°C. That's why you should have measured 0°C (depending on the accuracy of your thermometer) in step 2. When the water in a bottle is supercooled (below 0°C) it is not in equilibrium, since there is no ice. But once the first solid crystal forms, the amount of ice increases as more water freezes and the mixture quickly reaches equilibrium at 0°C- i.e. the temperature actually goes up as the water freezes, releasing the latent heat of fusion (see Additional Experiments below). That's why the ice in the bottle is very soft and slushy, rather than frozen hard. To freeze the bottle hard you must remove this extra heat somehow, perhaps by placing it back in the cooler. To supercool a water bottle you lower it's temperature below the normal equilibrium freezing point by removing heat. Since heat only flows from hotter objects to colder ones, you need to place your bottle in contact with something colder, such as the cold air in a freezer. But most home freezers are typically set at about -20 to -40°C, so leaving the bottle in the freezer too long will lower the temperature so much that it is almost certain to form a seed crystal somewhere then freeze completely. Unless you can put a thermometer inside the bottle, you must check it often and remove it once it is supercooled but not frozen, which can be tricky. Another problem with this method is that most freezers use motors which cause vibrations, and just like when you tapped the bottle, can form a seed crystal and freeze the water. You could use the ice water bath you prepared in Step 2 to cool the water, but this bath is in equilibrium at 0°C, so you can only cool your bottles to this temperature, which is not cold enough to instantly freeze the water. To supercool your bottles you need an ice-water bath that is much colder than 0°C. Fortunately liquid water (or any solvent) has another very useful property- the freezing point of a solution (anything dissolved in a solvent) is always lower than the freezing point of the pure solvent. In our case this means that dissolving salt in water (the solvent) lowers the freezing point of the salt-water solution, i.e. you must get it colder than pure water before it will freeze. This is why it is much harder to freeze sea water than fresh water. Note that this is not the same as supercooled water; the salt-water is a solution, not pure water. This is also why you sprinkle salt on an icy road to melt it. The salt dissolves into the thin layer of liquid water that is usually present on the surface (unless the icy is very, very cold), lowering the temperature required for the ice to remain frozen. The more salt you dissolve, the lower the freezing point. It doesn't matter what kind of salt (or anything else) you use, only how much you dissolve in the water. This is called a colligative property, meaning that it depends only on the number of particles, not their type. Since solid ice is usually much colder than 0°C (you measured that in Step 1), adding ice to a salt water solution lowers the temperature of the solution. And since the freezing point of this salt-water-ice solution bath (the temperature where freezing and melting is in equilibrium) is lower that that of a pure water-ice bath, we can use this to supercool our bottles of pure water. By adding enough salt it's relatively easy to prepare a bath that is -10°C or colder. There are other interesting ways to instantly freeze supercooled water. Very carefully unscrew the top from one of your bottles without freezing the water. 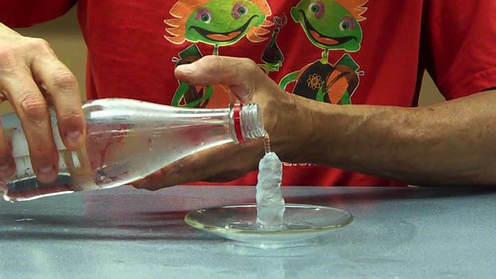 Drop a small piece of ice into the water and watch as it instantly initiates freezing in the bottle. Since this piece is already solid, it serves as the seed crystal to which the liquid molecules can easily attach. You can also try slowly pouring liquid supercooled water from the bottle onto a dish with a small piece of ice. The water will freeze as it hits the ice then continue freezing right up the pouring stream and into the bottle. For another experiment, carefully place a thermometer in the bottle of supercooled liquid water. It should read a temperature well below 0°C. Now drop a small piece of ice into the bottle to initiate freezing and observe the temperature rise as the water freezes, until it finally reaches 0°C. As water freezes it releases heat (called the latent heat of fusion), and this heat has nowhere to go except into the rest of the water and ice in the bottle, which actually remelts some of the ice that has just frozen. This is why the bottle doesn't freeze into hard ice, but forms a very wet, slushy ice. Since the ice and water is now in equilibrium, its temperature must be at the freezing point, or 0°C. ​Experiment with different types of water, which behave differently as they freeze. Some may freeze sooner (at higher temperatures), or faster, or form different shaped crystals. Note that most of these waters are actually not pure (only distilled or deionized water is pure) and contain various dissolved minerals, so their freezing point is slightly lower (just as with the salt-water bath you prepared). They are so dilute, however, that the effects of the solutes are generally negligible. Sparkling or carbonated waters are a noticeable exception. They contain dissolved carbon dioxide, so opening a bottle releases gas bubbles which may initiate freezing (they serve as nucleation sites for ice crystals to form), as well as lowering the concentration of the solute (carbon dioxide) and raising the freezing point. You can also experiment with different temperatures of supercooled water. Generally speaking, the colder the water, the faster it will freeze once you start the process. In particular, warmer but srtill supercooled water freezes slowly enough that you can easily watch individual crystals growing. Sometimes they form large snowflakes, making it appear to be snowing inside your bottle. Super-saturated (or supercooled) sodium acetate solutions also crystalize and freeze instantly, releasing a tremendous amount of latent heat as they freeze, making them useful for "heat packs".